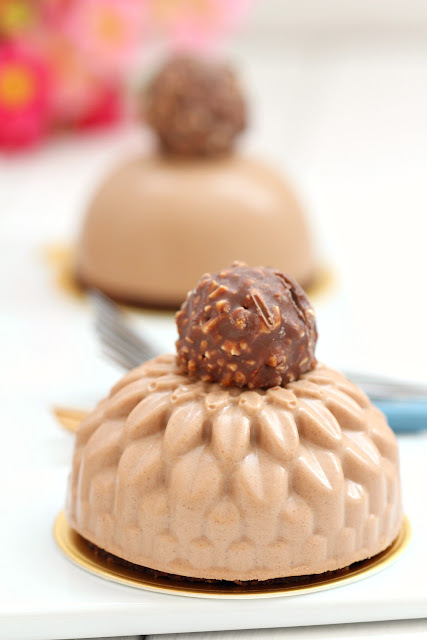 my bare cupboard: Nutella mousse cakes "
Calling all Nutella lovers ! Culling out some of my bread spreads that are near their expiration date . I usually buy them for baking or making frozen desserts rather than consuming with bread or crackers . Most of them though are left lurking in the darkest corner of the fridge 😁 So far , I've got matcha cream , Maltesers' Teasers , Reese's peanut butter chocolate , cherry jam , peanut butter , homemade ube jam and of course , Nutella . 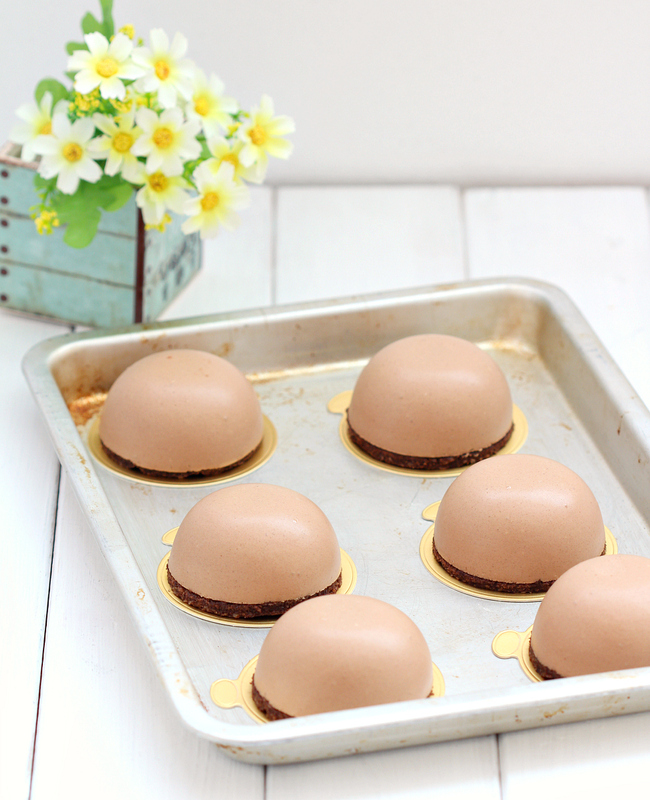 This creamy , dreamy dessert is a custard base mousse , unlike some recipes that only uses gelatin , this version is made just like a custard-based ice cream . Milk and egg yolks are cooked until it thickens and the rest of the ingredients are added . It yields a smooth and creamy texture that is much better than the matcha mousse tarts I made last time . When I make Nutella ice cream , this recipe will be my inspiration . I decided to fill 6 of the mousse with Nutella but a Nutella filling will turn a bit hard after several hours of freezing ; defrosting it for an hour will soften the mousse but the filling will take time . I think adding a bit of cream to make it lighter or maybe make a Nutella jelly (?) would be much better instead . That said the mousse alone is worth making . 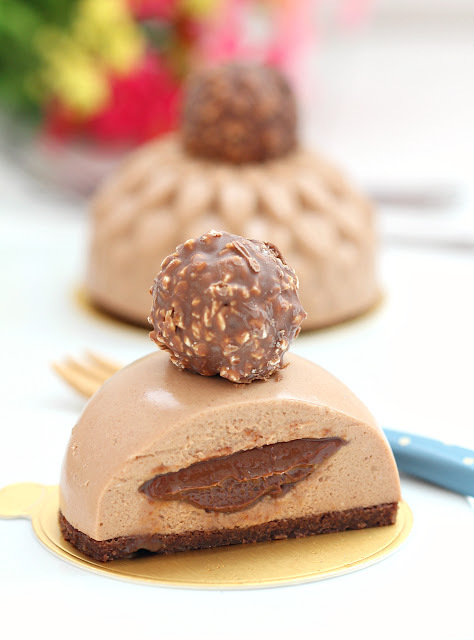 The mousse recipe I listed below is my slightly tweaked version . I omitted the melted milk chocolate and added more Nutella ; used cream cheese instead of mascarpone and 6-inch mousse ring rather than silicone moulds . The biscuit base on its own taste like Nutella . I tried the biscuit/joconde recipe from one of my fave food site , substituting ground almonds with hazelnuts . It may not be as thick as I would like it to be , me being the master of over mixing the batter - good thing that I used a smaller pan instead of what is recommended least I'll be scraping the biscuit instead of cutting it lol But still quiet happy with the taste . If you want to try the recipe , double the amount and don't over mix the batter . * Line a 10-inch square baking pan with parchment paper . * Preheat oven to 190ºC . * In a mixing bowl , sift in icing sugar , hazelnut powder , cocoa powder and cake flour , mix to combine . Add in the egg and stir until mixture thickens , set aside . * In a clean bowl , beat the egg white and sugar until firm peaks form . * Add melted butter to cocoa-hazelnut batter , mix well to combine . Gently fold half of the meringue to the batter then mix in the remaining half . * Pour batter into the prepared baking pan , spread batter evenly . Bake for 10 minutes or until cook through . Once baked , let cool completely before using . * Using a cookie mould or any round glass ( it should be the same size as the top of the moulds ) cut out 7 pieces 7-cm round biscuits . * Line a baking sheet with plastic wrap . Spoon 6 pieces of Nutella at 20 grams each , about 2-inch round , leave space between each piece . Freeze until needed . * Prepare the silicone moulds . * Pour cream in a mixing bowl and beat until firm peaks form , chill in the fridge until needed . * Place cream cheese in a large mixing bowl and stir until smooth , set aside . * Place milk in a saucepan and bring to a boil over low heat . * Soak gelatin sheets in a cold water for 10 minutes . * Meanwhile , whisk egg yolks and sugar until light and fluffy . When milk is hot , pour gradually into the yolk mixture , whisking as you pour to prevent curdling . Pour back egg-milk mixture into the pan and cook over low heat until thickens , about 6-8 minutes . Strain custard into the bowl with cream cheese , stir until smooth . Mix in the custard powder then add in the Nutella , mix until well combined . * Squeeze excess water from softened gelatin and place in a heatproof bowl together with the drinking water . Place bowl in a saucepan with barely simmering water , stir until gelatin is dissolved completely . Stir gelatin into the Nutella mixture and mix until smooth . Add in the whipped cream into the mixture and stir gently until well combined . 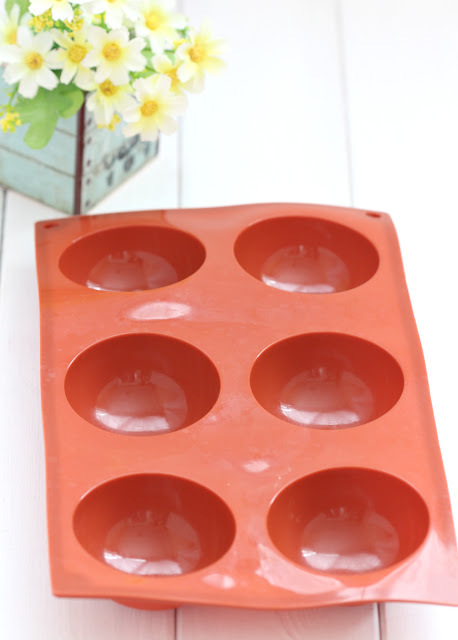 * Pour mixture into the silicone moulds , fill each cavity halfway , place a piece of frozen Nutella on top then pour in more mixture almost to the rim of the mould . Top with cut out round biscuits . 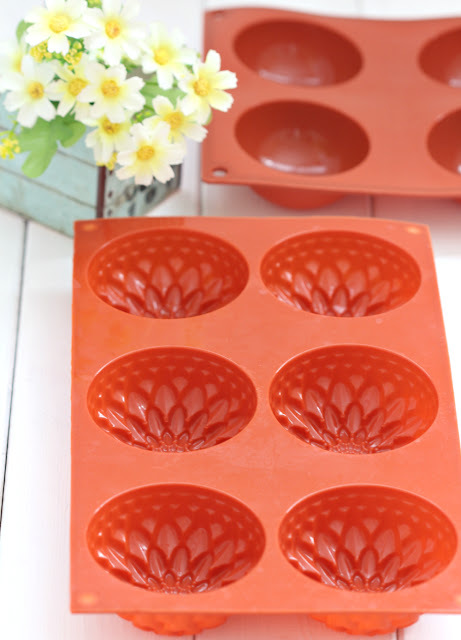 * Put moulds in the freezer for at least 4 hours or overnight . 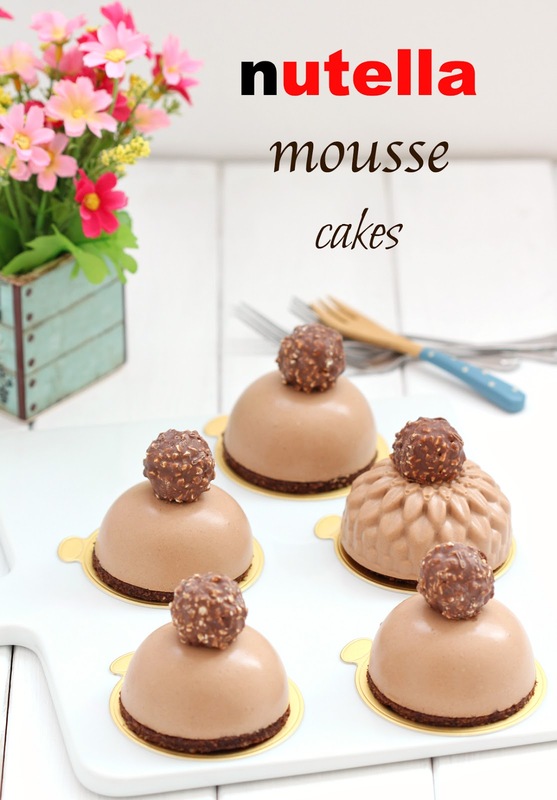 Take out moulds from the freezer , unmould each frozen mousse and place in a baking sheet or a serving plate , let soften in the fridge for at least an hour before serving . 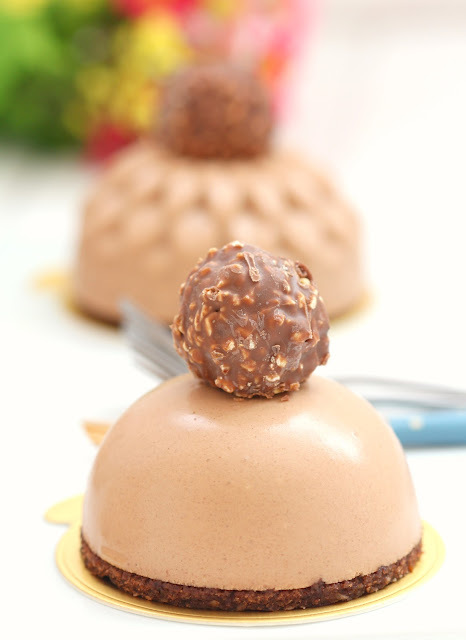 Top with rocher , if available . These are stunning, Anne! 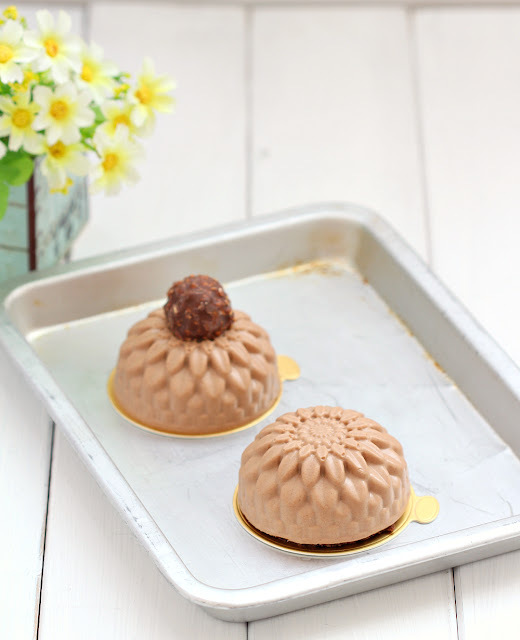 I need to get some of those silicone molds and hope I can create something as beautiful as these cakes! OMFG these are gorgeous!! Seriously, professional grade, I'd pay $7 each at a patisserie! Ooo.... it looks like something from a PRO ! Good job, Anne. Happy Easter day to you & family ! Hi Anne, your moose cake look like to die for kind. Too pretty to be eaten. Thanks for sharing this awesome recipe. Nice clicks.